Every time you walk, run or stand, you're putting stress on your knee joints, and soccer players put more stress on their knees than non-athletes. The supporting elements of the knee joint are composed almost exclusively of soft tissues, such as tendons, ligaments, cartilage and small muscles that are prone to injury. Once you understand what's causing your pain, you can choose a treatment option, prevent future pain and get back in the game. Chondromalacia refers to a dull, achy pain beneath the knee cap as a result of overuse, and the condition is very common in runners, cyclists and soccer players. The sudden changes in direction common in soccer play can cause tears to the anterior cruciate ligament, or ACL, or the meniscus. Both injuries usually cause severe pain, swelling, difficulty straightening your knee and a feeling of joint instability. How you treat your knee pain depends largely on the cause. ACL injuries, or tears to the meniscus, might require arthroscopic surgery. 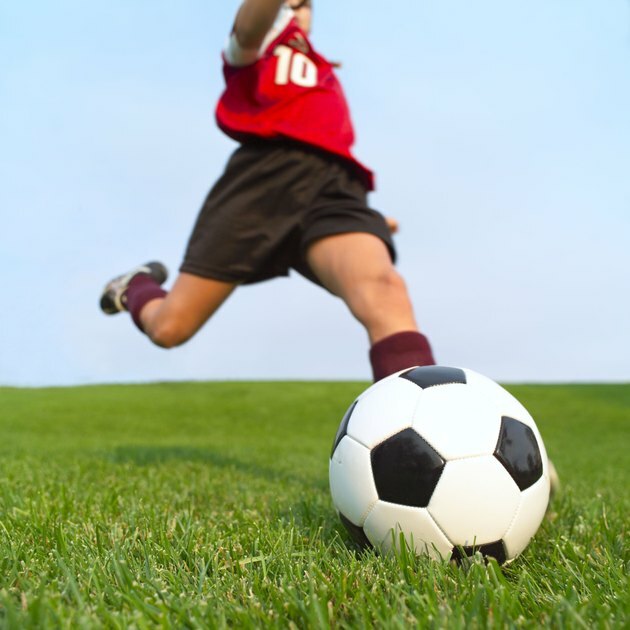 General knee pain from chondromalacia that many players experience in soccer can be treated with over-the-counter pain medication, icing, bracing or taping for support, and lower-impact activities that don't involve rapid direction changes. If you experience sudden, sharp or persistent knee pain while playing, make an appointment with your physician or an athletic trainer. Once you've treated your knee pain, you should take steps to ensure your injury doesn't happen again. Check your cleats for signs of wear and tear, especially in the soles. Replace worn shoes with new supportive ones. If you suffer from chondromalacia, consider talking with a physical therapist about exercises to improve your knee alignment when you walk or run. Do strength training on the muscles in your legs to help lend support to your knee. Your quadriceps, hamstrings and outer hip muscles lend stability to your knee joint. When you jump for a header or step with a high impact after changing directions or kicking the ball, these muscles keep your knee from caving inward. Try leg presses, lunges, squats, leg extensions and hamstring curls to build up strength in your upper leg muscles and help prevent future knee pain and injury. Health Services at Columbia: What Is Chondromalacia?